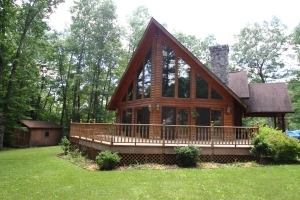 This Cedar Siding Chalet has recently received a ''total transformation'' to the Interior. Freshly painted, new lighting, up-dated Kitchen. 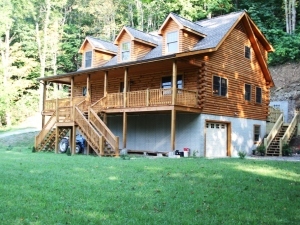 Close to the The Greenbrier River & Trail. Offers 2 Bedrooms, 3 baths and full finished basement. 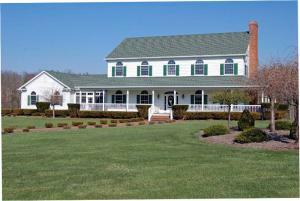 Enjoy the wrap around deck & privacy on over 1.9 Acres. 2 Gas Fireplaces, Cathedral ceilings and loft area are just a few features this home offers. FURNISHED, FURNISHED HOME!! This IS one-of-a-kind home that features a gourmet kitchen w/oak cabinets, tile floors, DR, LR w/brick fpl, master suite w/sitting area, master bath w/jacuzzi, all custom built cabinetry, 3 bedrooms, each w/private bath & walk-in closet, sunroom. Full walkout basement w/laundry rm, storage, gym & full bath. 3 car heated garage w/ workshop. More acreage is available.